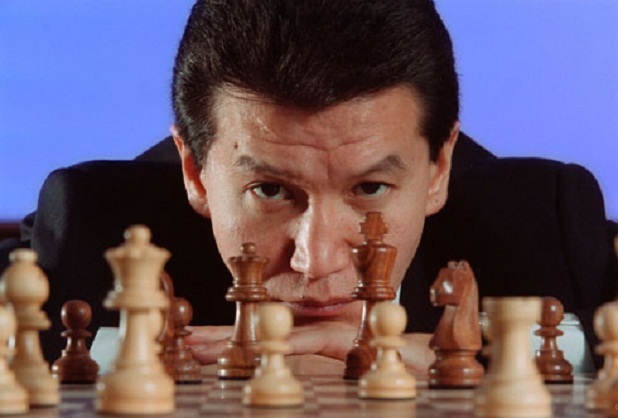 Outside the circles of chess-players and Russian politics buffs, it is unlikely that many people will be familiar with Kirsan Ilyumzhinov, erratic multi-millionaire businessman and, for the last seventeen years, autocratic president of the Republic of Kalmykia, situated within the Russian Federation. Kalmykia is a tiny republic with a population of only 300,000 people, notable for being the only majority Buddhist-region in Europe. Most of the population are ethnic Kalmyks, descendants of Mongol herdsmen who settled in the 17th century, and who continue to speak a Mongolic language and retain a unique identity and culture that contrasts with the rest of the Russian Federation. Kalmykia has largely avoided the political violence and instability that is prevalent in the neighbouring republics of the North Caucasus. So when the country makes the headlines, more often than not it is the result of yet another bizarre statement by its president. Recently, he provoked incredulity after claiming to have been abducted and spoken to by aliens, prompting discussion amongst some Russian politicians over whether he was fit to govern. However, as will be seen, it is likely that Kirsan is quite happy to cultivate such an idiosyncratic image, as it helps to distract the international community from the dark reality of life for people in Kalmykia which easily becomes apparent on the most cursory of inspections. Apart from money, the other great love of Kirsan’s life is chess. As president of FIDE (Fédération internationale des échecs), the World Chess Federation, Kirsan has pumped millions of dollars into funding the game. At what price, however, has this come to the chess world? Kirsan maintains a vice-like grip over FIDE, reflecting the control he exercises over Kalmykia. 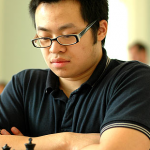 He has managed to garner the support of the majority of national chess federation presidents, ensuring a comfortable victory in the 2006 FIDE election. This year’s FIDE election, held in Khanty-Mansiysk, Russia, proved no exception. On the 29th September, Kirsan was re-elected as president for another four-year term, defeating the challenger, former World Champion Anatoly Karpov, by a wide margin. This despite the fact that he is loathed by many grassroots chess fans, and has been strongly criticised by many professional players, including former World Champion, Garry Kasparov, now an active member of the Russian opposition and as vocal a critic of the Kremlin as he is of Kirsan. While some national federation presidents are genuinely supportive of Kirsan, there are others who I suspect have their reservations but continue to vote for him for fear of losing the flow of lucrative funding that chess currently enjoys. Already, serious allegations of proxy-vote rigging, intimidation and fraud have tainted the 2010 FIDE election, which has been marked by unprecedented vitriol and personal insults from both sides. The emergence of Anatoly Karpov as the main challenger had inspired hope for many opposed to Kirsan’s monopoly on power. As a former world champion, and a living chess legend in the eyes of many, Karpov possessed a certain clout in the chess world that the 2006 challenger, Bessel Kok, was missing. He also enjoyed a substantial amount of support at grassroots level and from many professional players. Admittedly, the diminutive Karpov is not a charismatic character capable of inspiring adulation in the way his contemporary and rival Kasparov does, despite being a former World Champion and one of the greatest players of all time. Indeed, at his peak, Karpov’s reputation for dullness extended beyond his play (he once described his primary interest as stamp-collecting). However, it is arguable that as a former World Champion, and now elder statesman of the game, he could have brought an air of dignity and gravitas to the role of FIDE president, something which many feel has been conspicuous by its absence during Kirsan’s tenure. It is worth just sitting back for a moment to appreciate how hypocritical this statement is, in light of the lack of democracy in Kalmykia and the systematic and serious violations of human rights that have marked Kirsan’s rule. Kirsan’s audacity may be merely amusing to us, but for the ordinary citizens of Kalmykia there is very little to laugh about. Kalmykia is one of the most impoverished republics in the Russian Federation. Millions have been wasted by Kirsan on eccentric personal projects, such as the creation of ‘Chess City’ in the capital Elista, while ordinary Kalmyks wallow in poverty. Media rights group Reporters Without Borders are on record as stating that the Kalmyk authorities “are among the most repressive towards the media in the entire Russian Federation”. The editor of the only opposition newspaper in Kalmykia, Larisa Yudina, was murdered in 1998 by Ilyumzhinov loyalists. The dubious company Kirsan keeps does little to dispel the tin-pot dictator image. He counted Saddam Hussein as a friend for example, even paying a visit to Baghdad in the 1990s, when the Iraqi dictator was a virtual pariah in the wake of the first Gulf War. His attempts at the time to host a World Championship match in Baghdad failed. Interestingly, the only time Kirsan has faced a stern rebuke from the Russian authorities was when he threatened secession in the 1990s after a dispute over tax payments. He was humiliated into backing down after the Russians expressed their displeasure. It seems that as long as you’re prepared to remain loyal to Russia, then the Kremlin is happy to turn a blind eye even to the most egregious human rights abuses. This is a trend that resonates across the North Caucasus; witness the notorious and well-documented excesses of the pro-Moscow regime in Chechnya. It is a matter of concern for many in the chess world that national chess federations have largely ignored these considerations, and effectively allowed FIDE to be held hostage to Kirsan’s wealth, giving him free rein to run FIDE like his own personal property, just as he treats his own impoverished country. Many who are sympathetic to this view would have instinctively supported Karpov for the presidency. However, it would be somewhat naive to look on the Karpov campaign with rose-tinted spectacles and to view the 2010 FIDE election simplistically as a struggle between the forces of democracy and dictatorship. After all, it was Karpov, the Soviet golden boy of the 1970s and 80s, who originally supported Kirsan for the position of FIDE president, back in 1995. A ‘reconciliation’ press conference, held the day after Kirsan’s victory, casts even more doubt on Karpov’s intentions and his credentials as an alternative to Kirsan. Despite the mudslinging and personal insults that had characterised the election campaign, Karpov and Kirsan sat smiling, side by side. 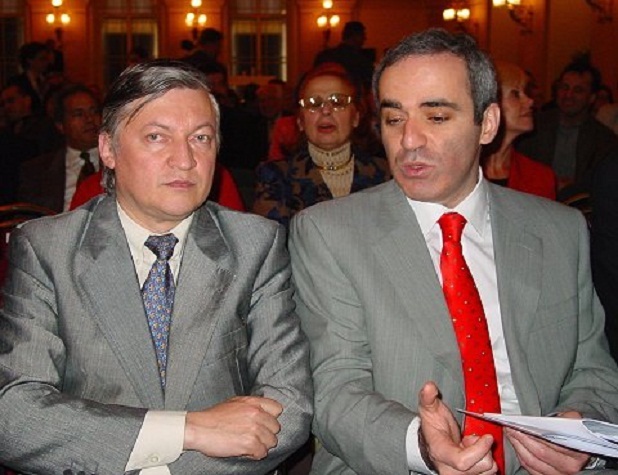 Karpov even agreed to consider Kirsan’s offer of the post of FIDE vice-president. To add to the confusion and intrigue, two days later, in a phone call to British Chess Magazine editor Steve Giddins, Karpov once again rebuffed Kirsan, now claiming that he had felt forced to put on a show of reconciliation in order to protect his supporters from facing personal reprisals from the Ilyumzhinov camp! It is but a sad fact that the hypocrisies of chess politics mirror those which we are used to in conventional politics. According to former FIDE Central Committee member David Levy, ‘idealists in the chess world’ have been misguided right from the beginning. Levy does not profess a cult-like loyalty to Kirsan, but he feels resigned to pragmatism. In his own words, ‘money isn’t everything, but when you are running FIDE it sure helps!’ When you take into account the uphill struggle for chess to gain sponsorship and promotion today, as a chess-lover one cannot help but sympathise with the point he makes. At the same time however, you can be sure that as long as Kirsan remains in control of FIDE, there will always be those who believe that he hinders rather than helps the image of chess, and who will thus be prepared to speak out and push for regime change. Whether the idealists will turn to apathy in the wake of this year’s FIDE election remains to be seen. The 2010 Chess Olympiad, also held in Khanty-Mansiysk, concluded on Sunday. A nailbiting finish to the tournament saw Ukraine emerge victorious in a repeat of their 2004 triumph, a mere point ahead of Russia who had to content themselves with the silver medal. In the final round, a draw with Israel, the bronze medal-winners, was enough to secure the gold-medal for Ukraine. Russia was unable to capitalise despite out-rating their opponents, Spain, on every board. Former World Champion Kramnik defeated his old rival Shirov (originally from Latvia, but now representing Spain) on top board, but Peter Svidler suffered a reversal on board 3 against Ivan Salgado Lopez, despite having the white pieces. With the other two games being drawn, this put paid to Russia’s hopes of regaining the title which had been their exclusive possession from 1992 to 2002. In the Women’s Chess Olympiad, the result was far more emphatic, as the Russian women, led by the Kosintseva sisters, swept the board, quite literally. They finished four points clear of second-placed China, hammering Bulgaria 4-0 in round ten to secure the gold medal with a round to spare. So both gold-medals remain in the hands of former Soviet states for yet another two years; not in itself a huge surprise, and there were to be relatively few in this year’s Olympiad as, for the most part, the weak were overwhelmed by the strong. Perhaps the most surprising outcome of the 2010 Chess Olympiad was the poor form of the world number one, Norwegian wunderkind Magnus Carlsen, whose performance included three losses. In contrast, one of the best performances came from world number nine Vassily Ivanchuk, a relative veteran at 41, having been in the world’s top ten before Carlsen was even born, but still competing at the very highest level. He finished with an overall rating performance of 2890, winning the board one gold medal. Despite the ugliness of the FIDE presidential pantomime taking place in the background, some sparkling chess was still produced over the board during the 2010 Olympiad. I leave you with a position from Ivan Salgado Lopez’s surprise win over Peter Svidler in the final round. In this position, Salgado Lopez played 27…Rxd5! What happens if White then takes the pawn with 28.Bxe4? Solution to follow in the next column. These are good articles! Interesting and readable. 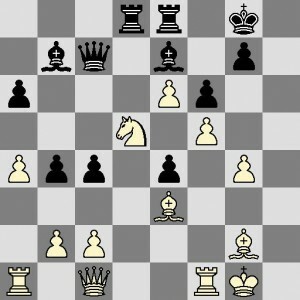 If white takes on e4 with the bishop, then 28. Qg3+ appears to win for black. If 29. Bg2 then 29. Rd1 looks good, pinning the rook, and if 29. Kh1 then 29. Rd2 is instead the killing blow, due to the threat of Bxe4. Both are quite pleasing mating threats. Is that right? Looking forward to the next instalment, but for now I have a lecture on writing music for an orchestra! I am not sure that Karpov having an interest in stamp collecting marks him out as being dull. I agree that compared to Fischer before him, and Kasparov following him, Karpov does seem dull. I suspect that this has more to do with Karpov having a reputation as a conformist within the Soviet regime that prevailed whilst he was world champion. In my own club, the late Joe Soesan, who in his time had been a very strong chess player as well as holding down a job as a senior executive with Shell, not only was a trained scientist but also qualified as a barrister. One of his interests was stamp collecting and he amassed a chess related collection. Colin Searle, a former Chairman of the Leamington League, owns a specialist stamp collection focused on Gibraltar. Meanwhile Roger Edwards, who served for 11 years as the BCF Director of Grading, has for as long as I have known him run a business in philately alongside his day job. I would not have regarded Joe, Colin or Roger as dull people, and their interest in stamps has been a facet of each of their several interests. Thanks for your comment Bruce! I don’t believe that having an interest in stamp-collecting marks Karpov (or anyone for that matter) as being necessarily dull either, but nevertheless it undoubtedly feeds into popular perceptions (misconceptions? ), however flawed these might be. After all, I’m sure I’m not the only person who has been unfairly labelled ‘boring’ at some point because I play chess! Undoubtedly there are other reasons, as you rightly mention, why Karpov developed a boring reputation. My use of stamp-collecting as an example is a trite one and rather facetious, but helps to convey the (ironic) point that Karpov has a reputation for dullness even amongst his fellow players.